Groupware must deal with a myriad of concerns. Some of them are typical of “conventional” software while others are idiosyncratic of CSCW applications (e.g., awareness). We claim that separating concerns fosters tailorability. While existing approaches for groupware design deal with the basic problem of separation of concerns (e.g., using well-known object-oriented techniques), they do not address the problems triggered by crosscutting concerns –i.e., when the realization of the same concern is scattered along multiple components, or when different concerns are “tangled” in the same component. 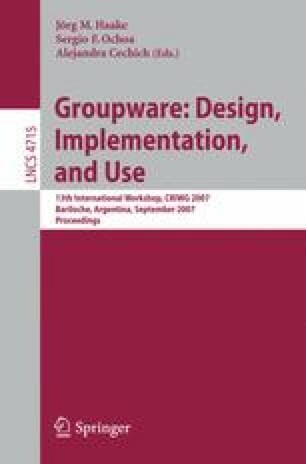 This paper presents a concern-oriented approach to requirement specification of groupware, characterizing the situations in which crosscutting exists. It follows the Theme approach for identification and design of crosscutting concerns, uses AOP to eliminate tangling and scattering, and proposes a concern centric approach to groupware tailorability.